As I did a quick flit through River Island the other I had my head turned by this skirt (sorry, rubbish photos alert!). Thought you deserved a true to life shot but this is by no means any better! Yes, you did hear right, I had my head turned by a skirt! I have a grand total of 3 skirts in my wardrobe, 2 maxi's and a short (holiday wear only) denim skirt. So this lovely little number got my cogs whirring! 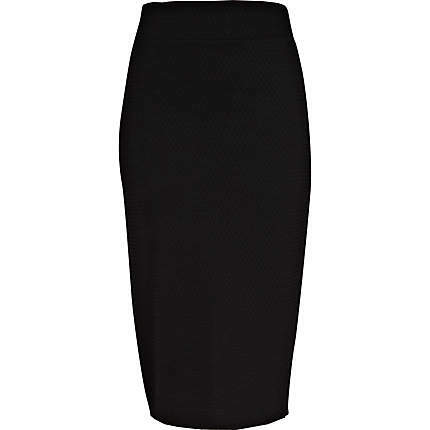 After my recent post about the great wedding outfit debate.....should I wear something I already own or splurge on something new, I realised that dressier things for me are just not worth spending the money on as I don't get the pay per wear out of them.......anyway so let's get back to the pencil skirt. Don't fall about laughing, I know it's only just September but I was thinking ahead and about the festive party season! This skirt is just £20.....such a steal as it can be styled in such a variety of ways! So much more flexible than a dress! This item could well end up being my evening wear saviour! It's hard to tell from the photo's but the skirt is black and has a honeycomb-look texture and is coated which gives it a wet/leather look. After the success of coated skinny's in my evening wear wardrobe last year, I think this skirt will be my go-to staple this year! So I have thrown a few outfits together to show just how versatile this will be for me! First outfit, I've teamed the skirt with a Topshop Cami, H&M Belt, a touch of leopard print with the H&M Shoes and a Mulberry cuff. Here I've gone for a coloured cami from River Island, H&M belt again, Accessorize necklace, Mango cuff and Zara sandals. Next up Zara cream lace top, River Island Shoes and Mulberry cuff.....very lady like don't you think??! Back to a bit more black, Zara drape top, D&G belt, River Island shoes and Reiss cuff. I have also tried to work in a couple of more daytime options and I have to say I really love the skirt with this jacket! I've even tried to dress it down for a workwear look with some flatties! I can't believe how much I am loving the skirt, it's the perfect wardrobe addition for me! I have also realised that I seem to have picked up many, many great pieces from River Island.....didn't realise until now how much I shop there! Oooh hello! Braved a full length shot for Avenue 57 on this day! Wow, tons of outfits - I love that skirt as much as you do! Shows off your fabulous figure. I am literally writing a blog post about River Island and how I need £1000 because that is how much I could spend in there at the moment! If I had some of my Winter stuff around I could have done tons more looks Fiona....but kept it real and how I could wear it right now! There is some great stuff in River Island right now, I could have a had a big splurge too! Amazing skirt, I love it(now that`s no surprise, I`m a skirt/dress-girl)! My favourite outfit is the one with the white jacket and I`m sure there are a hundered more ways to wear it(e.g. with an oversized tee... or a jumper for colder weather)...so versatile! Oh my I am loving your blog and I think everything you wear you wear with effortless style and grace. I love the skirt (want one as soon as I have shrunk my baby weight off). Seriously you must be a personal stylist, but if not you should be. I am sure shops would snap you up to showcase the clothes to the best ability. Wow! Thank you for the fabulous comment! I'm glad you are enjoying the blog! It really is lovely to get such positive feedback since I'm very new to this! Mhairi, thank you! The skirt is the coated-textured one, don't tell me I have linked up to the wrong one....silly me, I'm still getting to grips with this and it is a rubbish photo....well that's my excuse! You've done an amazing styling job with that skirt. If absolutely pressed, I think my faves would be the halter neck frill top and also the white jacket. Definitely a brilliant buy! But then you have the gorgeous figure which helps make it look so good! Would love to see you in a skirt Helen.....don't think we ever had over on A57! !